There is a new arrival in the baby gear world this spring, the newly hatched STOKKE Scoot Stroller. The luxurious Norwegian baby gear brand first rocked the world of strollers in 2003 with the STOKKE Xplory and this season they are rolling out the new Scoot and Crusi strollers. The latter is a single stroller that can be easily converted to a double, retailing at just under one and a half grand (see detailed Crusi video). The Scoot gives you a similar look and features for nearly half the price for $699.99. While there is no bassinet or second seat option as with the Crusi, it features a reversible seat that can face the parent or face out and the higher seat position that STOKKE is famous for. A smooth and stylish ride for baby that will turn heads everywhere. Not to mention it makes travel with baby easier! Check out the latest STOKKE Scoot review and video to see the stroller in action. Purchase: You can pre-order the STOKKE Scoot online at Magic Beans. It will also be available through the STOKKE shop in the near future. 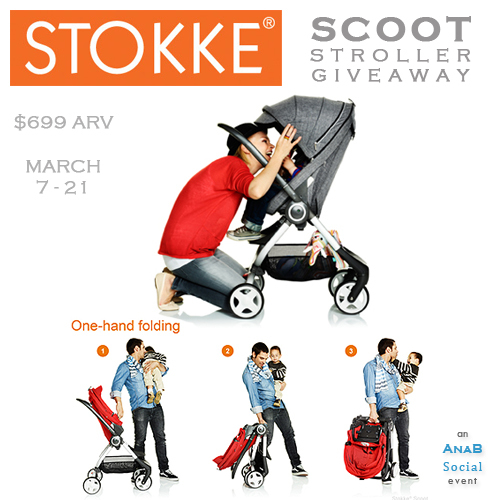 STOKKE is generously giving away the STOKKE Scoot in Black Melange (as pictured on entry form) to one winner! Disclaimer: Mommy of Two Little Monkeys and all participating event bloggers are not responsible for sponsor prize shipment.